Since we are all home for the summer, I am trying to mix up snacks (and recipes) to keep things a little more exciting. Ean and I tried these Copy Cat Auntie Anne’s pretzels a couple of weeks ago (thanks Pintrest), they are AMAZING! Ean loved helping roll out the dough…and eating them. Warm up the milk in the microwave or on the stove for just about one and a half minutes. It should be about 110º. If it’s too hot it will kill the yeast. You should be able to comfortably keep your finger in it. Stir in the yeast and let it sit for about 3 minutes. Add the butter and sugar. Add the flour about 1 cup at a time and the add the fine salt. Kneed for about 10 minutes with a stand mixer, or by hand. Put it in a greased bowl and cover with greased cling wrap. Let rise for 1 hour in a moist, warm place until doubled in size. Preheat the oven to 450º. Divide dough into 12 lumps. Roll them all out as thin as you can. Combine the warm water and baking soda in a wide bowl. Form the dough into pretzel shapes, then dip in the baking soda water. Place on a greased baking sheet and sprinkle with coarse salt. Bake for about 7-11 minutes or until browned. Dip each in the melted butter while hot. 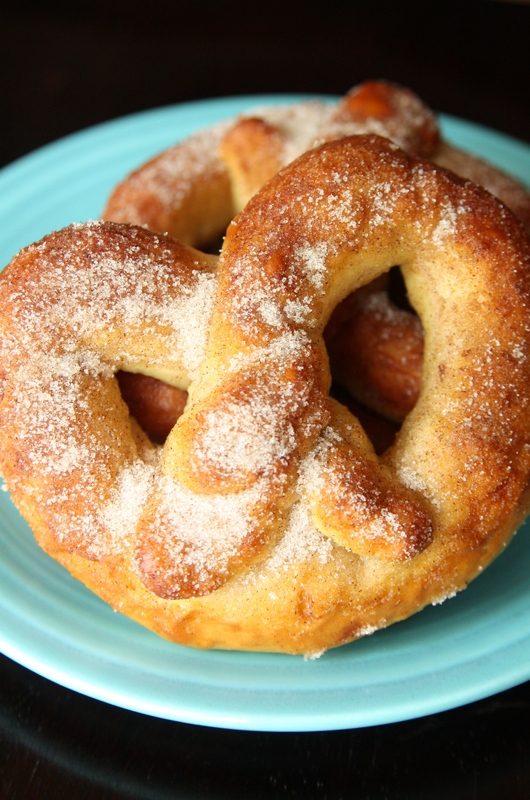 My favorite are the Cinnamon & Sugar pretzels, so I sprinkled most of ours with a good amount of cinnamon and sugar right after dipping them in butter. This entry was posted in Bite Size Goodness. Bookmark the permalink. Awesome! I’ve been wanting to try homemade pretzels for the last year or so. I hope you enjoy them Kristina! We couldn’t stay out of them! my family doesnt like salt too much, so i ended up just putting sugar and cinnamon on them, also instead of the shape, i ended up braiding some of the dough.